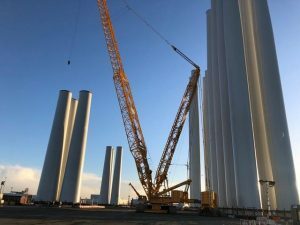 Windhoist Limited has pre-assembled the first Siemens Gamesa turbines destined for the Hornsea Project One offshore wind farm in the UK. According to the UK-based company, 24 Siemens Gamesa SWT-7.0-154 turbines are now standing ready for the vessel to pick them up next month. Siemens Gamesa awarded Windhoist with the contract for the onshore turbine pre-assembly in September 2018. According to information from November, 104 out of 174 turbine monopile foundations and 66 out of 174 inter-array cables have been installed at the site some 120km off the Yorkshire coast. Hornsea One will comprise 174 turbines, three offshore substations and a Reactive Compensation Station (RCS). Half of the turbines will be installed by Fred. Olsen Windcarrier’s jack-up Bold Tern, with the remainder set to be installed by A2SEA. Last year, Ørsted divested 50% of the 1.2W offshore wind farm to Global Infrastructure Partners (GIP).